[description] => After Kaala, Rajinikanth has geared up for his next Karthik Subbaraj-directed film, which has been titled, Petta. [articleBody] => The makers of Rajinikanth’s 165th film revealed the much-awaited title of his next film last month. After Kaala, Rajinikanth has geared up for his next Karthik Subbaraj-directed film, which has been titled, Petta. The makers of the film had released the motion poster to make an announcement on the film's title, which is quite appealing and impactful. Now, the makers have unveiled the first poster and it sees the superstar in a dashing appearance. Rajinikanth can be seen in a jolly look wearing a sweater with a shirt and jeans. The first look is looking quite cool and this only makes us curious to know more about Rajinikanth's role in the film. The entire motion poster - featuring Rajinikanth turning and walking in slow motion - unfolds inside a church. Petta also stars Nawazuddin Siddiqui, Vijay Sethupathi, Trisha Krishnan among others in important roles. The film marks the Tamil debut of Nawazuddin Siddiqui, and Vijay Sethupathi apparently plays the antagonist. 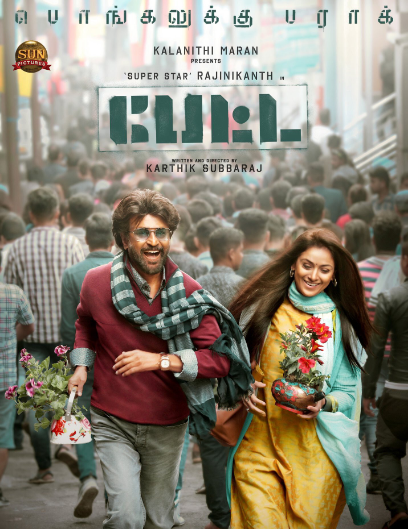 The director took to social media to share the first poster and wrote, "Here it is..... #Petta new poster featuring gorgeous Simran madam and Ever charming n Ever Stylishhh Thalaivaaaaa..."
Watch Petta’s motion poster here. In the film, Rajinikanth is rumoured to be playing a professor with a violent past. The shooting of the film has been majorly done in Darjeeling and Dehradun. Petta is expected to release next year. The team has currently geared up to wrap up the final schedule of the film. After Kaala, Rajinikanth has geared up for his next Karthik Subbaraj-directed film, which has been titled, Petta. The makers of Rajinikanth’s 165th film revealed the much-awaited title of his next film last month. After Kaala, Rajinikanth has geared up for his next Karthik Subbaraj-directed film, which has been titled, Petta. The makers of the film had released the motion poster to make an announcement on the film’s title, which is quite appealing and impactful. Now, the makers have unveiled the first poster and it sees the superstar in a dashing appearance. Rajinikanth can be seen in a jolly look wearing a sweater with a shirt and jeans. The first look is looking quite cool and this only makes us curious to know more about Rajinikanth’s role in the film. The entire motion poster – featuring Rajinikanth turning and walking in slow motion – unfolds inside a church.